Packing and moving can be an extremely tedious job and the time can never be enough. Often local household shifting within the city is considered as easy but it is a tiring and demanding task to pack and unpack all the stuff. 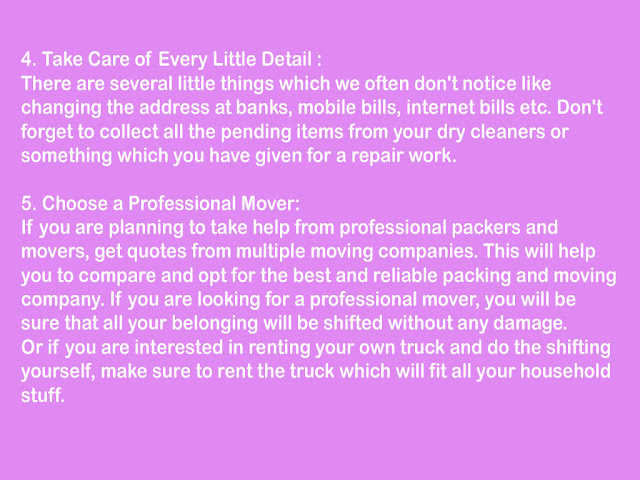 Below are few tips which will help you to ensure that your moving is done smoothly and easily. 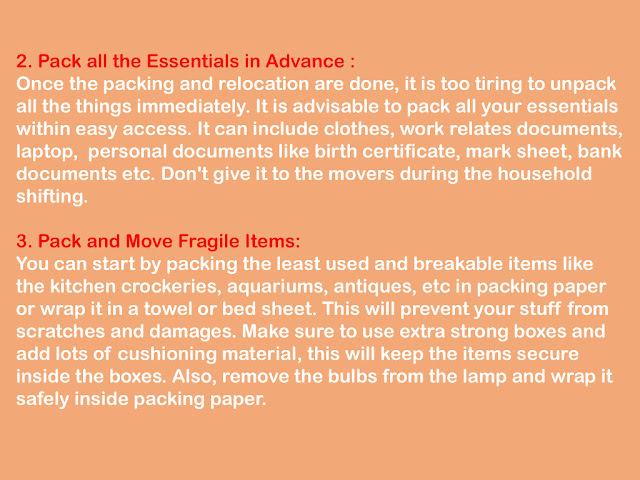 Packing and moving within the city seems to be easy but even a small mistake can lead to a stressful moving experience. It is important to plan and prepare the checklist in advance. There can be several important and small things which will be forgotten during the household shifting. 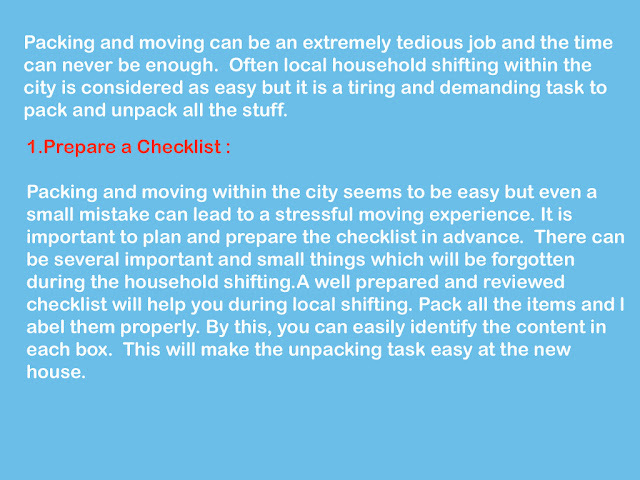 A well prepared and reviewed checklist will help you during local shifting. Pack all the items and label them properly. By this, you can easily identify the content in each box. This will make the unpacking task easy at the new house. Once the packing and relocation are done, it is too tiring to unpack all the things immediately. It is advisable to pack all your essentials within easy access. It can include clothes, work relates documents, laptop, personal documents like birth certificate, mark sheet, bank documents etc. Don't give it to the movers during the household shifting. You can start by packing the least used and breakable items like the kitchen crockeries, aquariums, antiques, etc in packing paper or wrap it in a towel or bed sheet. This will prevent your stuff from scratches and damages. Make sure to use extra strong boxes and add lots of cushioning material, this will keep the items secure inside the boxes. Also, remove the bulbs from the lamp and wrap it safely inside packing paper. There are several little things which we often don't notice like changing the address at banks, mobile bills, internet bills etc. Don't forget to collect all the pending items from your dry cleaners or something which you have given for a repair work. If you are planning to take help from professional packers and movers, get quotes from multiple moving companies. This will help you to compare and opt for the best and reliable packing and moving company. If you are looking for a professional mover, you will be sure that all your belonging will be shifted without any damage. Or if you are interested in renting your own truck and do the shifting yourself, make sure to rent the truck which will fit all your household stuff. You should first enlist the companies that offer the best packing and moving services for shifting and loading. Browse for more and more options and then select the top five among them. You can even use word of mouth for this step. 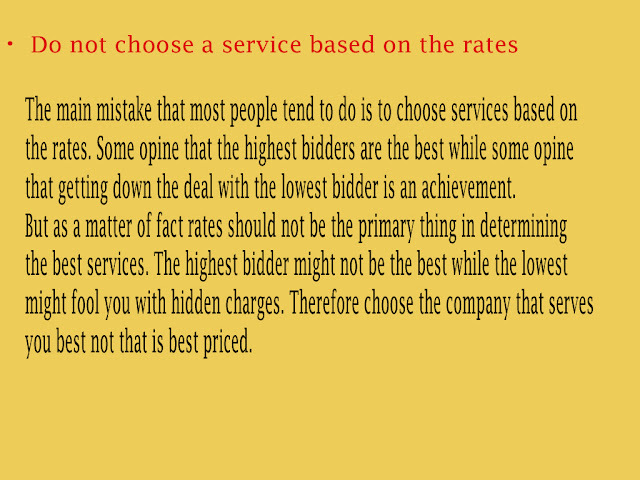 The price should be the main factor to get affordable services but the most important basis should be the quality. You shouldn’t compromise with the quality. First of all short list the companies that satisfy all your needs and requirements. Do compare prices too. Now when you have decided which movers and packers company you want to select to help you with the moving and packing, contact them. Call them home so that they can assess all your luggage and goods that is required to be moved. They will tell you about how to load the items. You should also tell them about your special requirements if any. Like people want their pictures and antiques to be extra protected and shielded. Now you must ask the company representative to submit the bid price that he would charge for the service. If the bid is affordable for you then check the company’s insurance and license so that you do not have to suffer any legal charges in future. You should select the mover after confirming with him the dates and the details of your relocation and ask them to provide a signed receipt and the bill of lading so that the items reach the exact location and at the right time without causing you any trouble or inconvenience. The whole task of packing things and then loading and unloading them involves great energy and time wastage. As a major part during shifting if this is given in the hands of the professional packers and movers then you can give more attention to the other important aspects. A professional group of packers and movers have skills and expertise related to the efficient packing and moving all your things with absolute care. This in turn saves money time and energy. Professional packers and movers make sure that they pack things with quality products and efficient methods so that you transfer all your valuables without causing damage to them. No one wants a damaged product, so you should always take the help of professional packers and movers in Bangalore when you are relocating. One of the biggest advantages of a professional packers and movers service is that they not only take well care of the goods but also compensate any loss that is caused by them during the transit of the goods. By hiring them you can ensure that your goods are all in the best and safe hands. The process of packing and getting things transferred with minute details is a hectic as well as stressful task. But if you hire a professional packers and movers service, then you can relive yourself from the stress and hazards involved in the process of getting things packed and transferred. A professional takes care of every aspect and makes sure that you can have your relocation in the most peaceful way possible. Relocation is something that involves a good amount of stress and confusion but when you get it done by the best professionals in Bangalore then you can stay relaxed and a lot burden in your head can be relieved. Hence for the most peaceful relocation always choose a professional. 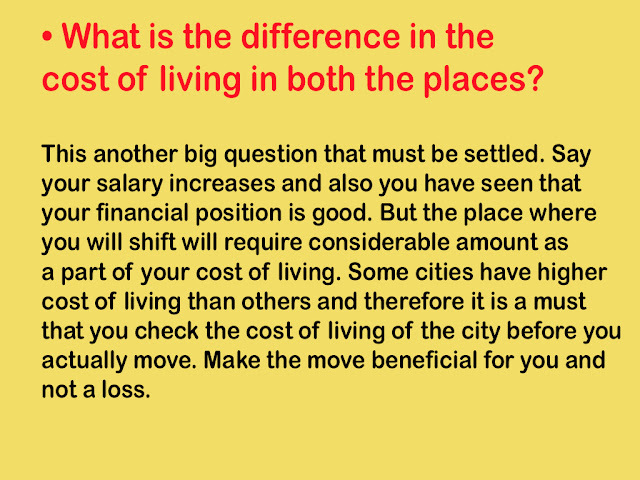 Bangalore is a beautiful city, Many people stay here for different reasons, some people need to shift from other city to Bangalore, some people shift from Bangalore to other city, some people need to shift with in the city of Bangalore from one area to an other area, For these reasons they need to hire one Professional packers and movers in Bangalore. You feel a little stunning when hiring packers and movers because there are zillions of packing and moving companies in your city. but which one is good, where do you even start to hire packers and movers.here is the list of things you should consider when you hire packers and movers. Thinking about relocating to a new area in same city or a other city? 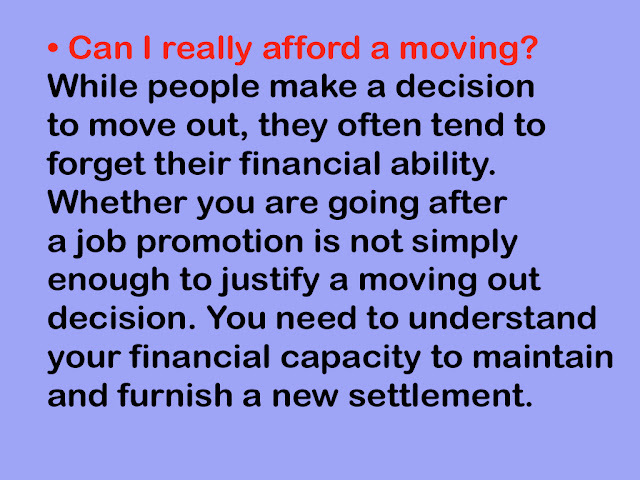 ask yourself few questions to determine if you're making the right move at the right time.you should think that relocating place is affordable or not, your family will adjust there or not,that place cost of living is affordable or not.